The best way to have a fun experience and get the best results is to find an experienced, local REALTOR™ who knows the area well. You’ll find that the best agents get most of their work from referrals because positive word-of-mouth spreads. With this in mind, ask friends and family members for potential referrals. You want to find a real estate expert who lives in the area and knows exactly what you are looking for – knowledge of the Sun Lakes real estate market, the various floor plans and what is going on in the community. 1. Look for relevant videos on Google. Video listings have taken over as the preferred search method for real estate and communities. For example, go to Google and then “Videos,” and type in “Sun Lakes Realtor.” You will see that The Kolb Team is dominant. You want a Buyer’s Agent who dominates the market you are considering, is actively engaged exclusively in buyer representation, knows the community, and can answer your specific questions. 2. Search and find agents who dominate the market. Visit the websites of appropriate experts. Look for the ability to search for homes that are actively listed for sale by various community and price range. Find buyer resources, floor plans and partners such as lenders, title companies, home inspectors, and home warranty companies that you will eventually need. A good agent will include local news and real estate information on their website. For example, check out our easy-to-use news tab at thekolbteam.com. This data is updated regularly to give you inside information that you won’t find elsewhere. Once you choose the right real estate agent to help you, they should discuss the criteria you are seeking and implement a search from the Multiple Listing Service. This way, you get a notification the moment a home comes on the market that matches your desires. Zillow and other websites are not always up-to-date on what is available. This means that the MLS is your best friend when trying to find homes that are actively for sale – especially when there is a seller’s market and homes are selling rapidly. 5. Enjoy a personalized tour. When you are ready to begin viewing homes, your agent should give you a tour of the community and amenities, organize the search, schedule the showings, and get your feedback until they find the perfect home for you. 6. Learn about the offer process. Last, but not least, this may be a trip to learn more about Sun Lakes, or it could be your buying trip. The Arizona purchase contract has stipulations that must accompany any offer. Don’t lose out on a home because you didn’t have all of the necessary information in advance! Your agent should give you a copy of the Arizona home purchase contract and provide necessary details so that everything goes smoothly. Are you ready to enjoy the Sun Lakes Active Adult Community? 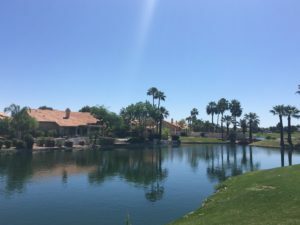 Buying Sun Lakes AZ real estate may be the best decision you’ve ever made! But to have a stress-free experience and get the home of your dreams, be sure to find an experienced, local real estate expert to help you through the process. We are standing by to help you find and obtain your dream home… and have fun, too! Contact us at 480-440-0849 or click here, and we will be in touch as soon as possible!